The average dimensions of a 15 yard dumpster are 14 feet long, 8 feet wide and 4 feet high. This dumpster size holds up to 15 cubic yards of debris—which is approximately 70-90 13-gallon trash bags. A 15 yard dumpster usually has a 2-3 ton (4,000-6,000 pound) weight limit. Our flat rate price covers the disposal costs for this amount of material. Keep in mind, your debris is often heavier than you think—for example, the average toilet weighs 100 pounds. Let our team know what you’re throwing out and they’ll give you pointers to avoid exceeding the weight limit. 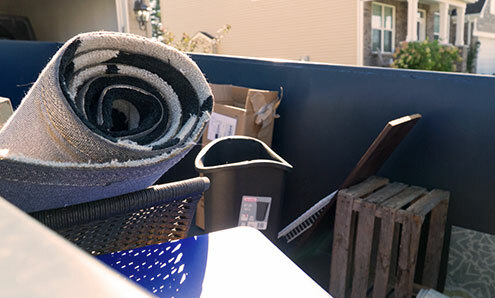 The cost of a 15 yard dumpster rental depends on a few different factors, but our rates are all-inclusive, covering delivery, pickup, taxes and disposal up to your container's weight limit. The exact price of a 15 yard container will depend on your location and the type of debris you're throwing out. Is a 15 Yard Dumpster the Right Fit For Your Project? Removing junk from a one and a half car garage. Decluttering bedrooms and an attic. 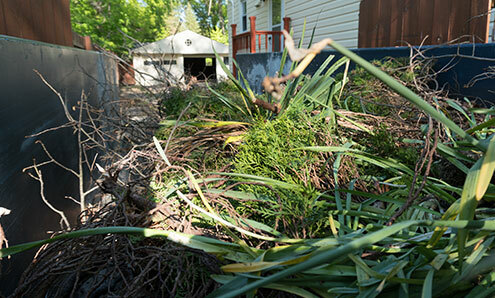 Removing debris from a yard cleanup. Not Sure a 15 Yard Dumpster Is Right for You? 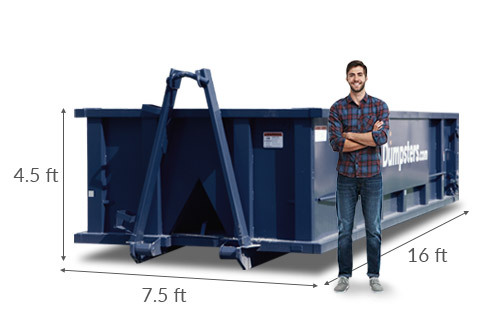 If you’re not sure a 15 yard roll off dumpster is the best call for your job, check out our other size options below or try our [weight calculator](https://www.dumpsters.com/resources/dumpster-weight-calculator) to estimate the correct fit for your amount of debris. Our team can also help you choose a size based on the scope of your project. Just give us a call at [844-444-DUMP](tel:+18444443867). Clear about 60 feet of driveway space to accommodate the delivery truck. If you plan to place the dumpster in the street, you may need to get a permit first. The truck needs about 23 feet of vertical clearance to unload the dumpster. Also make sure no locked gates, cars or other obstacles are blocking the area. Don't forget to call our team member to schedule pickup for your dumpster on or before the last day of your rental period. 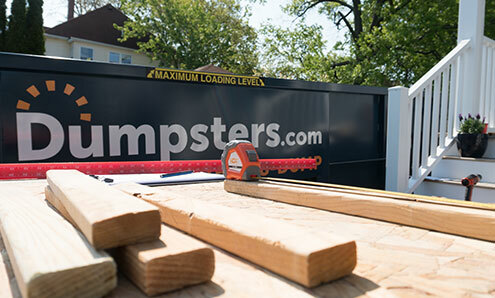 After you order your 15 yard dumpster, our team will send you a detailed email about what to expect, along with a list of prohibited items and a copy of your invoice. If you have any questions or want to double-check anything with your rental, just give us a call.